Tucked away in the Canadian Rocky Mountains is the road that goes from Lake Louise to Jasper. This highway called the Glacier Parkway has along it stop after stop of fantastic tourist attractions and natural phenomenons. 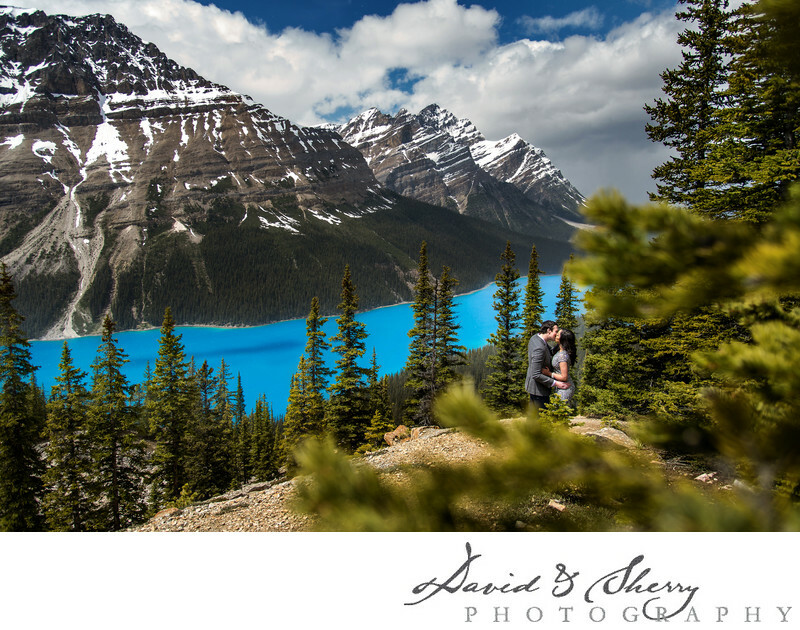 This particular photo was taken at Peyto Lake which is one of the lakes that you can hike at along the parkway. We have done many engagement photo shoots along this stretch of land and this is by far our favourite spot. Other wonderful natural blue mountain lakes include Lake Louise, Moraine Lake, Emerald Lake and the Columbia Ice Fields. Come with us to embark on a once in a lifetime experience where you will receive stunning photographs celebrating the love you share with your fiancee in one of the world's most naturally beautiful destinations and commemorate it with a one of a kind picture of the landscape with you and your significant other in it. We specialize in this kind of destination pre-wedding and engagement photography and would love to be there with you wherever you find beautiful. We travel across Canada for events without additional travel expense and would be happy to do the same for you. Yoho National Park and Banff National Park are two of our favourites and we can't wait to meet you there.